Well, I’m still cleaning out drawers and files and came across this. Take time to dream – it hitches the soul to the stars. Take time to think – it is the source of power. Take time to play – it is the secret of youth. Take time to read – it is the foundation of knowledge. Take time to worship – it is the highway of reverence and washes the dust of earth from your eyes. Take time to enjoy friends – it is the source of happiness. Take time to love – it is the one sacrament of life. Take time to laugh – it helps with life’s loads. Take time to beauty – it is everywhere in nature. Take time for health – it is the true treasure of life. Take time to plan – it is the secret of being able to have time for the first eleven things. As I was going through old files I came across a poem I wrote in 1978 when I was sixteen years old. I felt it was worth sharing to hopefully inspire your imagination. Echoing sounds of inner thoughts, filling scenes with bizarre animals and fairies. Gazing into transparent void, holding on to powerful secrets. Inventing mirages in the mind, jostling creativity around. Key to the universe, letting go of reality, mystic, never-ending. Opening windows that are sealed shut, possibly speaking with God. Queer surprises attacking thoughts, revealing the unknown. Soaring like the wind, reaching out into space. Time standing still, unexplainable adventures. Vague in explanation, without a mark and without a bound. Today is the 12th anniversary of my receiving a diagnosis of multiple sclerosis (MS). In honor of that blessed day I want to share a small portion of my new book, Be Your Own Superhero: A Road Map to Resilience when Faced with Chronic Dis-ease in the hope that it will bring comfort and inspiration to others who may be suffering from chronic stress or illness as well as encourage you to read/share my book. I promise it will be life-changing for the positive! You entered my life out of the blue in 2006, like a freight train derailing at top speed, and changed everything. You put me on the road less traveled; one that I would have ignored otherwise. As much as I tried to stay the course of my normal existence, you pushed me in the direction of another – the one truly meant for me even though I didn’t recognize it at the time. As I navigated this new life path, you tried with all your might to knock me down, but I refused to fall. Through your challenging lessons you have shown me that I am not weak but strong; not hopeless but determined; and not diseased but healthy for me. You have become an integral part of me and although I occasionally stumble, I always pick myself up, dust myself off and start anew. You may always be the proverbial “elephant in the room” but I have learned to look past your oversized body and see everything else for the blessings they are. When you first came into my life many people asked me, “Why you?” and my reply was simple: “Because I can handle it.” I find your entering my life to be the greatest gift I ever received. You awakened within me a strength I didn’t realize I had and taught me to live the life I want, not the one others think I should. You taught me a greater empathy for others who live their lives in constant suffering and gave me the tools to pass on my knowledge to help them be their own best advocates in order to live well. You also taught me what I have known all along even though I didn’t consciously realize it: when chaos arrives at my front door I do not panic. I respond with resilience. Learning to overcome adversity is truly one of life’s gifts. When faced with a challenge there is always an opportunity that lies within that can be discovered by Getting clear, Increasing understanding, Focusing and Taking action (G.I.F.T.). You offered me an opportunity, and through it I discovered my purpose of being and am able to live my best, healthiest life. Thanks to you I have come into my own. And although it is a long road to accepting and coming to terms with your existence, I know I have the courage and faith necessary to thrive. Through my story I will teach others how to navigate their life’s journey to their best ability by sharing how I traverse each step, each stumble and each giant leap, walking together down the path of life, taking that road less traveled. When life feels like it is at its worst, you have the opportunity to be at your best. When the proverbial sh*t hits the fan and you start beating yourself up with the negative self-talk, you need a virtual “Moonstruck” slap-in-the-face “snap-out-of-it” moment to help you shift your mindset. Yes, life is hard. Yes, life is stressful. Bad things will happen. It is inevitable. So what can you do about it? You can shift your mindset and respond with positivity; decreasing your stress and increasing your overall wellness. As in Joseph Campbell’s The Hero’s Journey, sometimes adversity pushes you out of your comfort zone and into the unknown. Often times the quest comes without warning; leaving little time to prepare. For example, when illness strikes you have little time to prepare for that overwhelming moment when you hear the dreaded words, “You have…” while panic automatically sets in causing you great stress. Stress can cause an increase in disease and dis-ease; taking a large toll on our physical and emotional health. And, in order to prevent falling further down this Rabbit hole of despair, you can discover your own resilience. As you age, you have no idea how, or if, your body will betray you. The unknown is a way of life. When you have resilience you know you’ve “got this” no matter the situation. Resilience is the measurement of whether you bend or break and is one’s ability to overcome, especially when faced with adversity such as a diagnosis. It is influenced by many factors including your current physical and emotional well-being, nutrition, and spiritual practices, if any. As you accept the ‘call to adventure’ when thrust into the unknown by adversity, you experience risk and reward; meeting each test of character, and undergoing positive transformation. Although you might not recognize it, you possess some ability or characteristic that makes you extraordinary and will assist you on your journey. My interpretation is this journey is how you discover the essence of your own resilience. Resilience can be learned and nurtured. To do so, I use a four-step strategic thinking process taught to me by my parents during childhood: get clear, increase understanding, focus, and take action (G.I.F.T.). 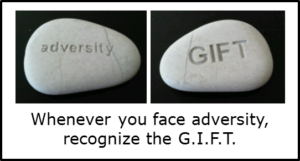 G.I.F.T., in essence, is a road-map to embodying resilience; affording you the ability to cope with adversity, clearly see life for the gift that it is, and help decrease stress while increasing your overall wellness. Does this blog post speak to you? Look for my upcoming book, Be Your Own Superhero, in October 2017.